7 Wedding Vows From Real Grooms that will Make You teary eyed! Perhaps the part we look forward to at most weddings are the wedding vows. Grooms and Brides around the world have started to personalize their wedding vows in order to make them more real, relatable and a little bit funny too. Through teary eyes, and tiny giggles we’ve put together seven of the sweetest vows from grooms to their brides. 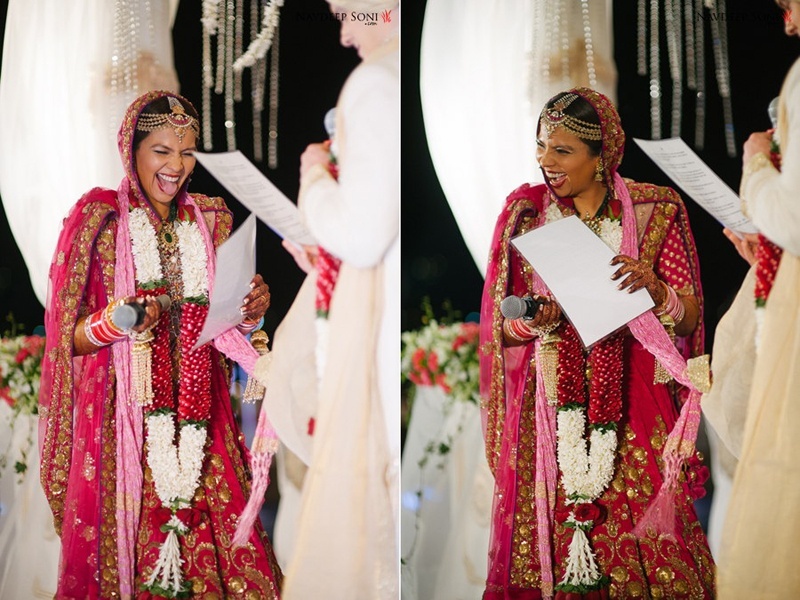 Weddingz Advice - SHOUTOUT to all Indian brides and grooms: No better day than your wedding day to express your love in your own words. If your wedding ceremony does not allow time and space for it, consider adopting this ritual from the West as part of your Sangeet, Engagement or a pre wedding function. You will both remember this forever. I want to spend the rest of my life with you. I vow to love and care for you as long as we both shall live. I take you with all your faults and strengths as I offer myself to you — with all my faults and strengths. I vow to help you when you need help and turn to you when I need help. I vow to choose you, every day, over and over, in good times and bad. And with this ring, I take you to be my lawfully-wedded wife, my constant friend, my partner-in-crime, and my love from this day forward. On this day, I give you my heart, my promise – that I will walk with you hand in hand, wherever our journey leads us – Living, learning, loving. Together, forever. Promises scare me. Maybe I’m too cautious in making them, fearing that changes in circumstance or changes in myself will take the ground out from under me someday. But promises can remind me of solid ground when things seem shaky. Here are the promises I can joyfully give you: I promise to be honest and not just superficially honest. I promise to show you the deep truth about who I am. I promise to listen, especially when it’s hard, because that’s when I most need to hear what you have to say. I promise to notice the gifts you give me and to appreciate them: your kisses, your kindness, your patience, your humour, your effort. I promise to take care of myself and let you help take care of me. I promise to encourage you to take care of yourself and help take care of you however I can. I promise to invest in us, all the work and all the risk, because I can see the rewards every day. I promise to be your partner, half of a team, working toward the same goal: happiness, together. I promise to be true to you, to uplift and support you. Be your toughest critic, your biggest support and your most comfortable shoulder to cry on. I will always share the last piece of cake with you be your best friend as we journey through life together. I have all of the stars with you. I have finally found my home, and it’s in you. I’ve never been this sure about love in my entire life, and I cherish every moment we spend together. Being with you has made my life interesting and complete. And if you ever find yourself asking, 'How long will I love you?' you already know the answer to that. I, choose you, to be my wife. I will respect you, care for you, and grow with you through good times and hard times, as your friend, companion, and partner, giving all that I can to fulfil our lives together. I promise to love and cherish you for the rest of your life. I will try to bring laughter to your life, and make you happy, I will always involve you in every decision I make and value your opinion highly. From this day forward, I will love you, honor you and cherish you completely – spirit, soul, mind and body. I promise to bring you flowers on a dull rainy day, and to always sing “My Girl” when you’re feeling down. I promise to spend the rest of my life trying to make you as happy as you make me. I love you and because of that, any circumstanace that life throws our way are okay, because with you, everything is perfect, complete, absolute. You are the person I was meant to spend the rest of my life with.